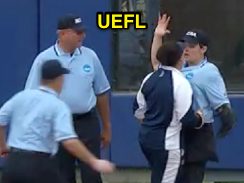 Already ejected, UCLA's Lisa Fernandez bumped HP Umpire Erin Peterson after a wild double play at the Women's College World Series on Saturday. Fernandez will now face possible suspension. Fernandez appears to shove Umpire Peterson. With one out and two on (R1, R3) in the top of the 6th inning of the Bruins-Aggies game, Bruins baserunner R1 Bubba Nichols attempted to steal second base in a delayed-steal tactic wherein baserunner R3 Gabrielle Maurice broke for the plate as Nichols became involved in a rundown situation between first and second base. Seeing Maurice's sprint toward home, Aggies shortstop Kristen Cuyos threw to catcher Ashley Walters, who applied a tag to Maurice's helmet, resulting in a collision, while Nichols continued running the bases. Walters then threw the ball to third baseman Riley Sartain, who threw to second baseman Kaitlyn Alderink with the tag of Nichols for the final out of the inning. NCAA Softball Rule 12.13.1 (Collisions) states, "A defensive player shall not block the base, plate or baseline without possession of the ball or not in the immediate act of catching the ball if it impedes the runner." Replays indicate Walters did not block the plate without being in the immediate act of catching the ball and that both runners were tagged while off base, the call was correct. At the time of the ejection, the Bruins were leading, 3-1. UCLA ultimately won the contest, 8-2. Following the play, HP Umpire Peterson ejected UCLA Assistant 1B Coach Fernandez (out call), and Fernandez responded by appearing to push Peterson after being ejected. NCAA Softball Misconduct Rule 13.3 states, in part, "Any threat of physical intimidation or harm, including pushing, shoving, spitting, kicking, throwing at or attempting to make aggressive physical contact, or use of equipment in a combative manner, shall not be tolerated and is grounds for a behavioral ejection combined with suspension...The perpetrator shall be ejected and then suspended from the institution’s next two previously scheduled and played contests in a traditional season (spring)." Wrap: UCLA Bruins vs. Texas A&M Aggies (WCWS), 6/3/17 | Video via "Read More"